Noyo Harbor is tucked into the forested hills at the south end of Fort Bragg. You may remember seeing Goldie Hawn and Kurt Russell sailing out of the harbor at the end of the movie Overboard. 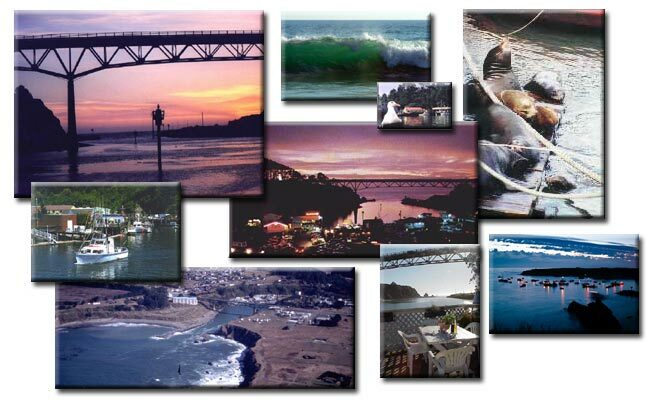 Noyo Harbor is a great starting point for a fun day out on the ocean, whether it's on a fishing or whale watching charter, or paddling your own kayak. Check these Charter Boats for schedules, events and reservation information. Have a great day! The entrance to Noyo Harbor is North/East of the Bridge. 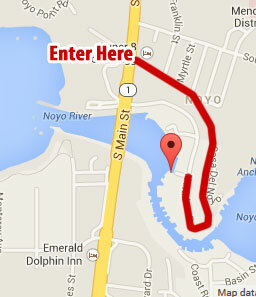 Turn East on to North Harbor Drive proceed along and turn into Casa del Noyo Drive. Follow along as it winds down the hill into the Harbor. You'll find Fishing Charter Boats and Waterfront restaurants!